Updated: Jan. 15, 2018, with comments from the developer. I’d probably rail passionately against this, if I wasn’t so busy doing exactly the same thing myself. 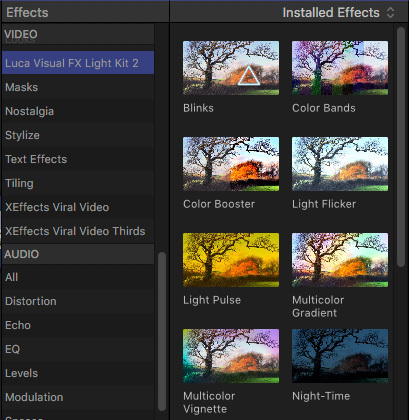 Which brings me to a recent email from Luca Bonomo, Founder of Luca Visual FX, about their newest release: Luca Visual FX Light Kit 2. For those that don’t know Luca, he’s a multi-award winning video-maker and editor with broadcast credits who has worked on a great variety of productions and for major clients. His visual effects are being used by broadcast tv channels and production companies such as Dreamworks, BBC and ITV as well as on big Film ands TV productions, including “The Walking Dead,” “Strictly Come Dancing” and various wild life documentaries. Luca started creating plugins for FCP6 and 7 using FXscript before moving to FX Factory. 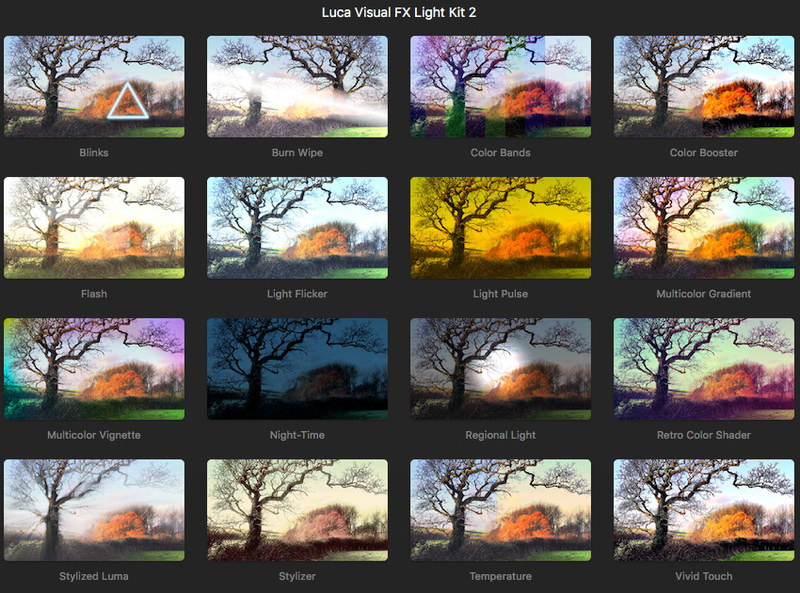 Installed as part of the FX Factory suite of effects, Luca Light Kit 2 includes 16 plugins (14 effects, 7 of which are brand new and 2 transitions) most of which reproduce a specific type of light effect such as flickering, regional, zooming, blurring, burn and flashing light. Other plug-ins in the suite, like Color Bands, Color Boost, Retro Color Shader, Night Time, Multicolor Gradient, Multicolor Vignette, Vivid Touch and Stylizer, offer new ways of stylizing images, colors and ambient light. Like all FX Factory effects, you need to install the free FX Factory engine – www.fxfactory.com – then install the plug-in. Installation is easy and takes less than a minute to install for all supported applications. The operation of the effect is essentially the same in all applications. If you think about it, one of the biggest challenges each of us face is getting potential viewers to stop long enough to watch our videos. This is especially true in commercials where our natural instinct is to click past the commercial because we can’t be bothered to watch it; even if its a subject we are interested in. This area of visual imagery is not something I worry about personally. I create and sell training. For me, the clearer and more understandable I make my videos, the more successful they are. I’m selling information, not emotion. But, for most story-tellers, how something looks is as important as the story it tells. A horror film is much scarier when set in the dark of night in a deserted warehouse, than in broad daylight on the beach. That’s where Luca comes in. 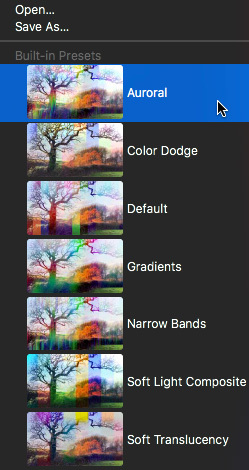 Basically, Luca Light Kit 2 gives us lots of different ways to change the look of our images in hopes that something that looks “different” stops a viewer long enough to watch what we create. Like all effects, you apply it to a clip, then tweak the settings until you get something you like, or makes you giggle, or leaves you gasping. Whichever. 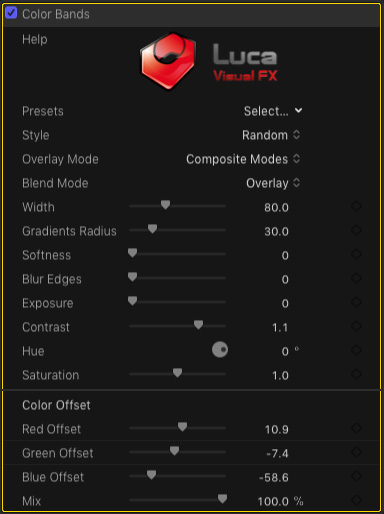 Each effect has presets that allow you to quickly check out a variety of looks for each effect. 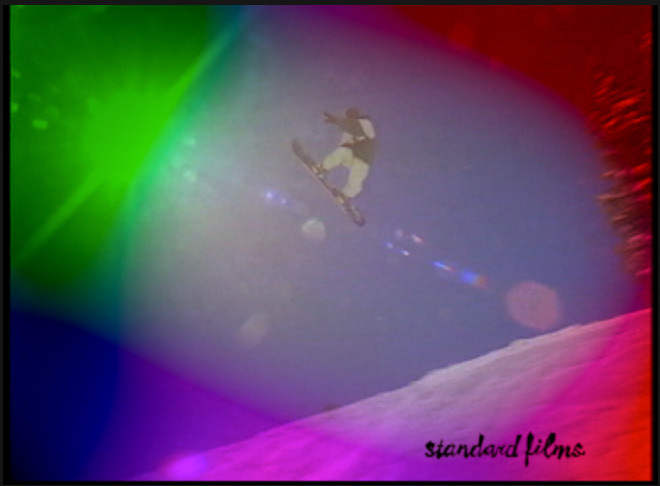 Here’s an example, the Multi-Color gradient, tweaked for colors, angles, soft edges and blend mode. Cool. I could go on and on – each effect is more interesting than the last. Some are more appropriate for darker night scenes and some create visual flickers which are impossible to reproduce in a written article. Well, OK, one more. This is Regional Light, where you can apply highlights to different regions within the clip. 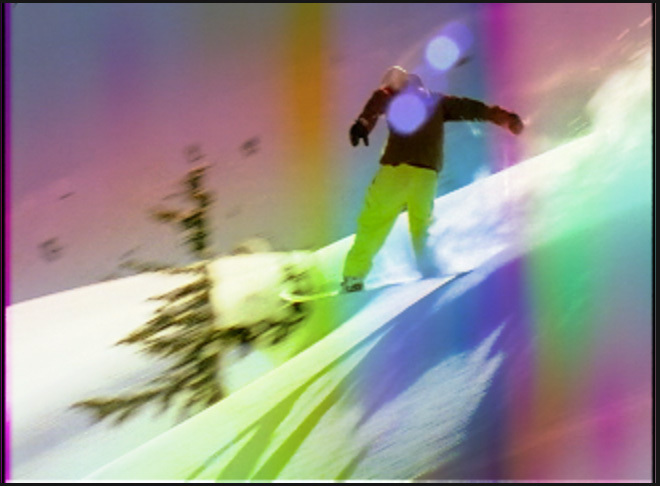 CAUTION: Many of these effects play with the luminance levels of a clip. For example, the Regional Light effect drives Luma levels well outside broadcast safe limits. For this reason, if you are doing work for broadcast, cable, DVD or DCP, you will need to apply a Broadcast Safe effect after these effects to keep your levels legal. Here’s an article that describes how to apply and adjust the Broadcast Safe effect in both Premiere and Final Cut. Luca Light Kit 2 is just plain fun. It creates easily adjustable visual effects that irresistibly attract the eye. 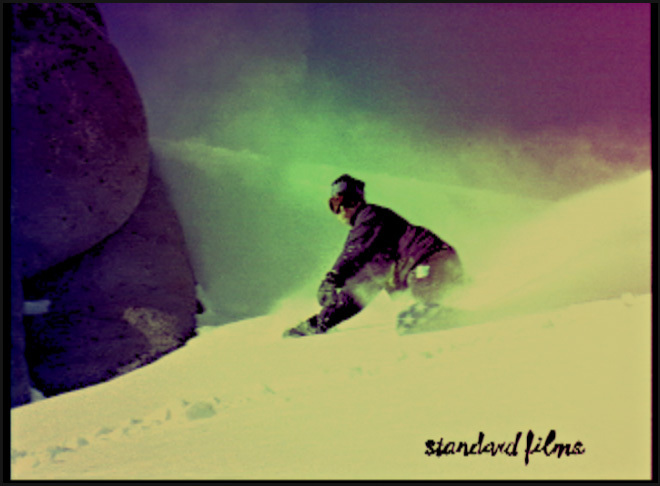 These are ideal for action sports, commercials, in-store displays or anywhere a unique visual look is essential to attracting viewers. However, if you are looking for an easy-to-use, flexible and affordable way to grab a viewer by the lapels and force them to watch, Luca Light Kit 2 is a great place to start. A free trial is available at: FXFactory.com. After reading this review, Luca, the developer, added a few more thoughts. Of course if one makes a heavy use of parameters like “Light Intensity” in a plugin like Regional Light that can indeed lead to excessive luminance levels, however to use this effect wisely editors should play with the color parameters (Light Tint and Image Tint) to create not only light but shadow, leaving light intensity normal. Please take a look at the example below created with Regional Light, as you can see the luminance is not “screeming” and the shadows were created mostly with the same plugin. Also, Light Kit 2.0 comes with a little plugin called “Temperature”, which can help limiting brightness intensity as well as correcting bleached areas . 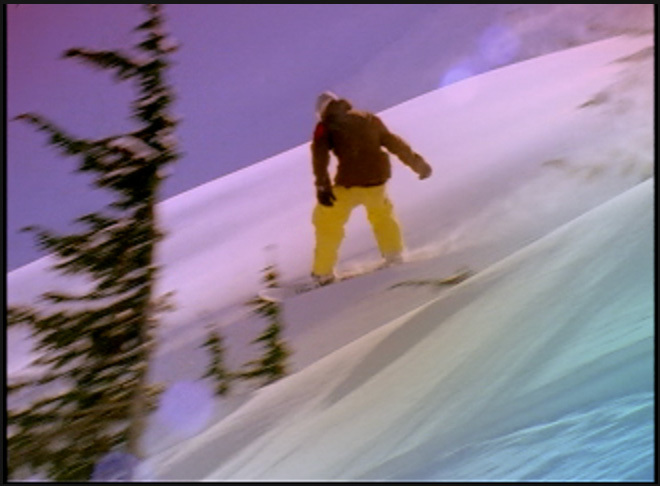 It basically reduces bright areas intensity by adding a warm (or cold) feel to the whites. A similar result can be achieved with the “Color” option in Stylized Luma plugin. Over the years I have worked on many different projects and I have to say Light Kit is the one pack of effects among all those that I have created that I have used more frequently. That’s probably because of the variety of effects it offers. The new version comes with 7 new effects, which are making me even more addicted to Light Kit :-).